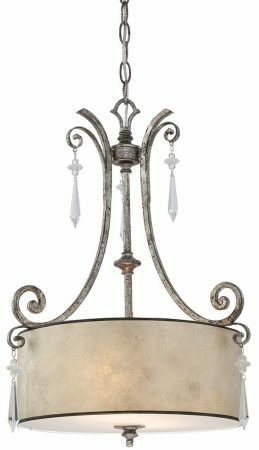 The Quoizel Kendra wrought iron 2 light pendant ceiling light in mottled silver finish, a superb quality cast wrought iron light fitting from Elstead Lighting and designed by Quoizel. The Kendra 2 light pendant with heavy scrolled cast arms and drum shade. Rather than a flat finish, the wrought iron frame is finished in a hand applied mottled silver over bronze and decorated with ice crystal drops accented with small floral clusters. The pearly mica shade adds a classy touch and sophistication to this classic design. This lovely ceiling pendant is a modern interpretation of a truly classic design and features elongated ice crystal drops accented with small floral clusters that add interest and sparkle. 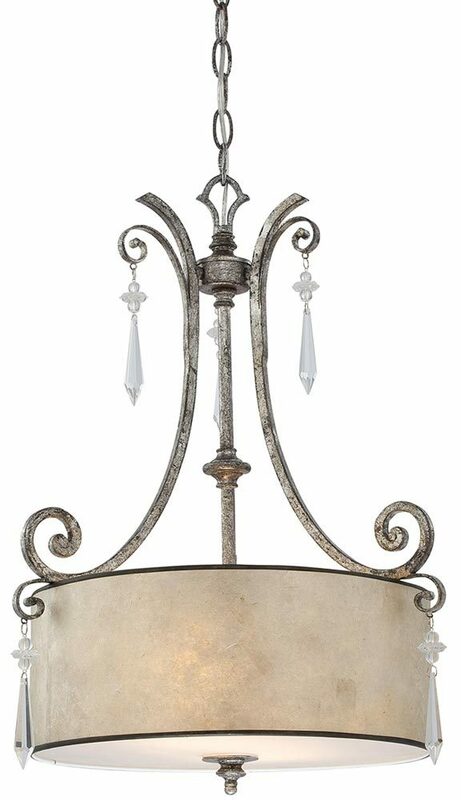 It will illuminate any traditionally themed home with natural elegance. This is a good sized pendant with a diameter of just 43cm and is supplied with height adjustable chain suspension that can be shortened to suit your situation, please see the technical information below for dimensions. It is well suited to installation in a hallway, vestibule, landing or any other smaller room in the house.